America lumbers toward another battle over whether to borrow to pay its bills in full and on time. Also, are we experiencing a bear-market rally? So might have quipped Will Rogers were he alive today (and about 180 degrees turned from his political philosophy). With the GOP thrown into chaos by the sudden withdrawal of Rep. Kevin McCarthy of California from the race for the speaker of the House of Representatives, the winners are the late humorist’s heirs on late-night television—but not the financial markets. While the fractious House Republicans try to come up with a successor to outgoing Speaker John Boehner, deadlines loom for major fiscal measures. First and most pressing, the Treasury says it will have exhausted all of its borrowing authority by Nov. 5, which yet again raises the specter of the first-ever default by the United States of America. Then, on Dec. 11, the government’s stop-gap spending authority runs out, which could lead to another shutdown of the federal government. A default would be a decapitation of sorts of the U.S. Treasury’s obligations, which stand at the head of the worldwide capital markets. The impact of America’s failing to pay its debts in full and on time is literally inestimable, given Treasury securities’ role of linchpin of the global financial system. The dysfunction in D.C. was a major reason for Standard & Poor’s shocking move to remove its triple-A imprimatur from the U.S. government’s obligations in 2011. Despite all of the ill-informed hysteria at the time that interest rates would shoot up on Main Street, nothing of the sort happened. But stocks slid in the aftermath of the S&P move. The Standard & Poor’s 500 plunged 6.7% right after the debt downgrade and ultimately suffered a 19% correction (although concerns about Federal Reserve policy and Europe added to the worries at the time). The ability of the U.S. to issue IOUs that are the favored asset of the rest of the globe, and that are denominated in the world’s main reserve currency and used as a store of value, as well as for trade and financial transactions, is an astounding advantage. Imagine if we were on a gold standard, and we had a mine with infinite reserves that could be extracted for zero cost. That is what the U.S. has with its ability to print dollars and issue Treasury securities. Even if Boehner manages to get a debt-ceiling increase through the House, Krueger says passing it in the Senate is “possible and probably doable, but it is no slam-dunk.” Democratic leader Harry Reid’s help will be needed because many GOP senators won’t go along, and it will take 60 votes to pass. “This issue will put all the 2016 presidential candidates under intense pressure from the business wing of the party to support a clean debt-ceiling raise and intense pressure from the Tea Party wing to oppose (Marco Rubio is probably in the toughest position),” he adds. With the speaker selection, the budget process, the fate of the Export-Import Bank, and the debt ceiling all coming to a head, “you have the political equivalent of a dumpster fire,” Krueger concludes. The irony is that the hottest ticket on Broadway is for Hamilton, a musical about the first Treasury secretary, who secured the credit of the young nation by consolidating the Revolutionary War debts incurred by the states. Maintaining the full faith and credit of the U.S. is vastly more important to the legacy of Alexander Hamilton than whether his visage continues to appear on the $10 bill. It would also be a way for life to imitate art in a good way. NONE OF WHICH KEPT the stock market from having its best week in some time. Going into Friday’s session, global equity markets’ valuations were enriched by some $2.5 trillion, according to Bloomberg calculations. As for U.S. stocks, Wilshire Associates reckons that they tacked on 3.44%, or approximately $800 billion, over the full week, based on the gain in the Wilshire 5000 index, their biggest weekly gain in nearly 12 months. Have bulls stampeded back into stocks? Not according to the strategy team at Bank of America Merrill Lynch, led by Michael Hartnett. In the latest week, equity funds had redemptions of some $4.3 billion, while fixed-income funds saw $2.4 billion exit. But money-market funds yielding essentially zilch garnered a massive $53 billion. The surge in cash equivalents indicates that the big rally in risky assets was “driven primarily by short-covering, rather than fresh risk-on” positioning, they write. The headlong rush into money markets inspired a couple of curious effects. The U.S. sold three-month Treasury bills at a yield of absolute zero—0.00%—for the first time. T-bills have traded at negative yields in the secondary market previously. Lending to Uncle Sam for bupkis isn’t unreasonable, given that the European Central Bank charges banks a fee to stash their cash there. In contrast, U.S. banks can earn 0.25% on their idle cash at the Fed. But we can’t get that deal, so T-bills go for zilch. This bizarro world of zero interest rates has gone still further, which is evident in the esoteric realm of options on eurodollar futures, through which banks and other institutions bet and hedge on the future level of the London interbank offered rate, the key money-market benchmark. So, somebody bought call options, betting that Libor would be zero next year, down from 0.3196% currently. That would imply that the federal-funds rate would be below zero, versus the Fed’s 0% to 0.25% target range, which is universally expected to rise, if not by year end, then in 2016. John Brady, managing director at R.J. O’Brien, a major Chicago futures broker, cautions that the purchase of call options for 0% Libor may have represented a hedge on some mind-bogglingly complex derivatives transaction. Yet the mere need to take out insurance (which is what options are, in essence) against negative interest rates, and pay a premium for it, implies something weird. Still, markets rallied, no doubt boosted by renewed expectations that a Fed rate hike is a 2016 event, even as central-bank officials and many economists cling to the idea that liftoff could take place before year end. While Louise contends that the highs of the six-year bull market have been seen, bear markets usually feature rallies. Even without speculation about the Fed’s deferring liftoff, she spied trends in the market that pointed to bounces in deeply depressed materials and energy stocks ahead of last week’s rebound. As for the latter, the Energy Select Sector SPDRxle in Your Value Your Change Short position exchange-traded fund (ticker: XLE) jumped 8% last week. The move could take the S&P 500 to the 2050 to 2060 range and the Dow Jones industrials to 17,500—from Friday closes of 2014 and 17,084, respectively—but long-term sell signals remain in place. In her monthly missive, Louise writes that the risk is for a retracement to the levels where the major averages broke out from their long-term trading ranges in 2013. In round numbers, that would be back to 14,000 on the DJIA and 1600 on the S&P 500. Good advice, as the market provides higher prices for losers, which are tax-loss candidates, and winners, as well. Decisions, decisions. Many Americans will have to make a big one in the next 60 days or so. How you decide will affect both your health and your wallet. Hospital management and doctors are seeing significant differences in the trends of patient care and are moving to adapt. Some of the changes they implement are going to create significant economic impacts on households and local communities. In this week’s letter we’re going to take another look at healthcare trends. Healthcare is roughly 20% of the economy and every bit as impactful as the energy and food sectors. Two years ago this week I wrote “The Road to a New Medical Order” with my friend and personal physician, Dr. Mike Roizen of the Cleveland Clinic. That letter was an attempt to calmly discuss the Obamacare launch and the changes it would bring. Mike and I have had an ongoing conversation about the changes in the healthcare world, and we visited at length as I was preparing this letter. Some of the changes that are coming are very positive, and others are downright remarkable, creating trends that no one seems to have even guessed at. Others are not so salutary. We’ll examine the great and not so great trends. Plus, I’ll offer some practical healthcare-related personal-finance tips for those of us of a certain generation. I was actually pretty excited to find some of this information, and so I’m going to enjoy passing it on to you. This week’s letter should be fun. Let’s dive right in. We are approaching “open enrollment” time for Medicare, Obamacare, and many employer health insurance plans. You can keep what you have – maybe. You can change plans, too. Should you change? No one really knows. Even if you manage to decipher what a plan does or doesn’t cover and at what cost, the realities of your coverage and costs can change very quickly. Readers outside the United States often tell me they can’t understand why we tolerate such a dysfunctional health care system and seemingly do our best to make it a little worse each year. I don’t understand, either. There are at least a dozen potential “fixes” to the Affordable Care Act (ACA, aka Obamacare) that 90% on both sides of the political aisle agree on, but there seems to be little willingness on either side to bring up a bill in Congress to accomplish those changes. One side wants to make wholesale changes in the system, and the other side wants no changes unless we go further down the road to a single-payer system. Healthcare really should not be a politically divisive issue. We all want to stay in good health; we all want sick people to receive good care; and we all want to do it economically and sustainably. Yet our healthcare system will probably be a major issue in next year’s election campaigns. As usual, the rhetoric will generate more heat than light. Today we will revisit some of the 2013 issues and predictions Mike and I shared with you and see how things are working out. Progress may not be the right word, but we definitely see change. We’ll begin with an impending change in the Medicare program for senior citizens like me. Having just turned 66, I’ve been on Medicare for a full year. So far, my experience has been unproblematic. I haven’t had any major health issues, so the worst part has been paying the monthly premiums. In July, the Medicare trustees issued a report estimating that next year’s Part B premium will have to rise 52% in order to keep the system solvent. That’s right, 52%. This will be an increase of $50 to $175 per month, again depending on your income. So much for 2% inflation. Those increases won’t stress me, but they will definitely be significant for many retirees who live on fixed incomes. These increases also illustrate the nuttiness of our system. Health and Human Services Secretary Sylvia Burwell, who will make the final decision on next year’s rates, has already pledged that some 70% of Medicare enrollees will be exempt from the rate increase. It gets worse. By what criteria, you may ask, will HHS decide who pays more or less? Current Medicare recipients who have their premiums deducted from their monthly Social Security checks won’t see a rate increase. That’s because the Social Security Act has a “safe harbor” provision that stipulates that a Medicare premium increase cannot exceed enrollees’ annual cost of living adjustments. And because we have almost zero inflation, Social Security will likely have no COLA this year. Who gets to hold the bag, then? Anyone who is currently on Medicare but pays premiums separately because they haven’t yet filed for Social Security. That includes people between ages 65 and 70 who are using the popular “file and suspend” strategy. It also includes anyone who first enrolls in Medicare during calendar 2016. They will pay the higher rates from the very start. This is obviously insane. Healthcare costs did not suddenly increase 52%, so premiums don’t need to go up that much for anyone. Yet because we have no inflation (at least according to the CPI), the government can’t legally raise rates for most Medicare participants. It has to make up the difference by extracting extra-high premiums from the unlucky few to which it has recourse. It gets worse. If you are in the unlucky 30%, you may have an escape clause. If you are over 65 and did the file and suspend trick, Kenny Landgraf at Kenjol Capital Management suggests just un-suspending for the rest of 2015. That will shift you to the other group so you can avoid the premium increase. Then you can refile and suspend again… maybe. No one seems completely sure about this. That maneuver, if it works, may be more hassle than it’s worth for many people, but the need for it definitely points up the absurdity of our Rube Goldberg healthcare machine. And we haven’t even looked at Obamacare yet. The reports I’ve seen show rates, coverage, and quality are all over the board, depending on who you are and where you live. The only obvious winners are people with preexisting conditions who didn’t have employer-provided coverage. In many states they couldn’t buy health insurance at any price prior to Obamacare. Now they can at least get overpriced and underwhelming Obamacare policies. For this group there has been a clear improvement. I think Patrick’s point may well be proven right in time. As a nation, we can’t afford to let talented people languish in jobs that don’t fully utilize their skills. Job lock depresses economic growth and ultimately punishes everyone. To the extent Obamacare solves this problem, it is an improvement on the pre-2014 system. That may be where the improvement ends, though. Obamacare’s expensive and complicated plumbing seems to have limited its value to millions of people. Going into 2014, about 32 million nonelderly Americans were uninsured, according to Kaiser Family Foundation. As of June 2015, some 10 million people had enrolled in state and federal Obamacare marketplace plans. Another 14 million had enrolled in Medicaid. These are moving targets, so the numbers are approximate. 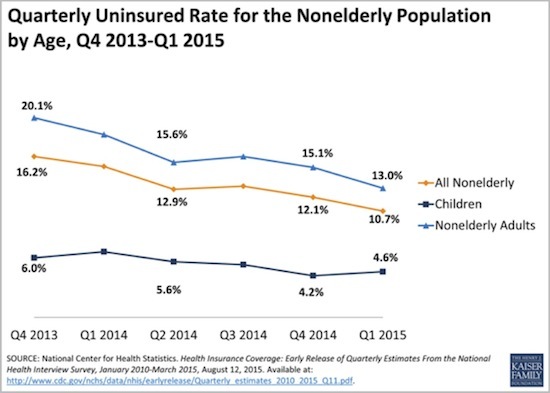 These newly covered people took the uninsured rate down from 16.2% just before the Obamacare rollout to 10.7% by Q1 2015. A majority of those who remain uninsured are self-employed or work for firms that don’t offer insurance. That means they are probably eligible for Obamacare marketplace plans. Why don’t they buy one? According to surveys, most say the plans cost too much. The tax credits available to those with incomes under 400% of poverty level don’t seem to work for many in the target audience. And let’s be clear: in some states there have been health insurance cost increases of 50 to 100% since 2010. Costs are still rising even for employer-provided coverage. 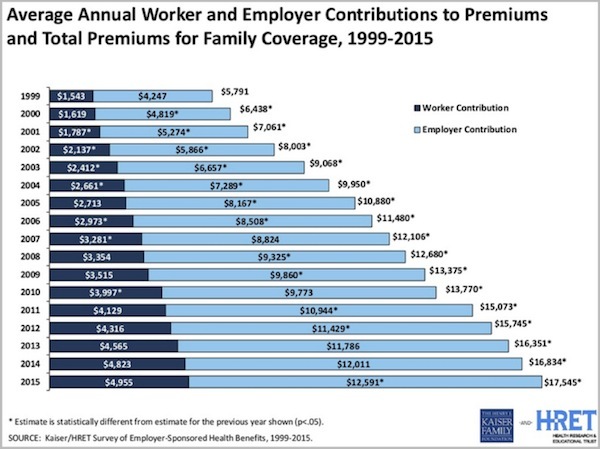 Kaiser has this interesting chart of premiums for workers and employers. The worker’s share of premiums for a family policy went from $1,543 in 1999 to $4,955 in 2015, a 321% increase. The employer’s share went up almost as much, from $4,247 to $12,591 (+296%). Let’s stop here a minute. We all know the economic reality. The employee really pays the full cost of his or her insurance. Companies simply factor their share into labor costs, right alongside salaries and other pay. Imagine that we have a typical white-collar worker with a spouse and two kids. His salary is $90,000. His employer gives him an insurance subsidy worth another $12,591, so he really makes $102,591. Of that total, he spends $17,545 for the employer and employee parts of health coverage. That’s 17.1% of his gross income, and he still has to pay deductibles if his family actually uses the health coverage. That could easily amount to another 4–5% of income. Does it make sense for us to be spending 20% of our gross income on healthcare that may not even make us any healthier? For some people it might be sensible, but for others probably not. This next Kaiser chart shows how premiums, deductibles, and earnings have looked against inflation since the ACA passed in 2010. Notice that deductibles are up hugely. We are going to come back to this in a minute, because it is having a major impact, in both good and bad ways, on how we buy healthcare. In the past five years, inflation rose 9%; earnings rose 10%; insurance premiums rose 24%; and insurance deductibles rose 67%. This is why workers feel so squeezed. The walls are closing in on them. Does anyone think this is sustainable? I’m not seeing many hands raised. 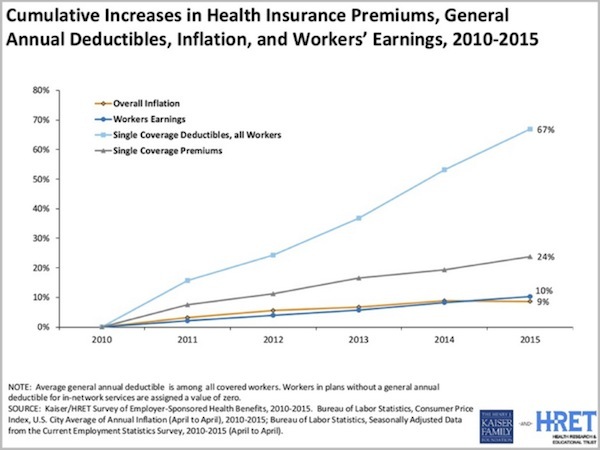 Workers are paying more for insurance, but rising deductibles mean they get less value from their expensive policies. I can understand why someone who makes $50-$100,000 a year thinks insurance is unaffordable. Premiums plus out-of-pocket costs can easily total more than a mortgage payment. As bad as the situation looks for consumers, there is suffering on the other side of the table, too. Healthcare providers are delivering more care to more people for less revenue. Let me share some of the ongoing conversations that I’ve been having with my doctor, Mike Roizen. The first and most curious change in healthcare is that healthcare spending patterns are starting to look like those in the retail sector. You get a “school season rush” and a larger end-of-year holiday season rush. In healthcare a similar pattern has been developing for several years now, and it seems to be the result of higher deductibles. When people get to the end of the year, they feel they need to use their deductible; so, to the extent they can, they go ahead and get medical procedures done prior to the end of the year when their deductible maxes out again. That’s good personal money management, but it puts a lot of stress on hospitals and other providers. And then what’s a provider to do in the after-season lull? It’s not like there are a lot of part-time workers on your staff whose hours you can cut back. This seasonal pattern seems to be accelerating in size and is going to be a real problem. Happily, there are very easy potential solutions. You could simply divide the country into four groups (or 12) and each group would have its deductible period conclude at the end of a different quarter or month. Let me speculate that this solution might not even need congressional action, especially given the other executive decisions made about the ACA in recent years. This problem should be relatively noncontroversial and easy to fix. Another approach that Mike was thinking of involves some kind of rolling average deductible, although that could get a little bit more complicated. But clearly, something has to be done. If this trend is not addressed, hospitals will have to start treating employees more like they are treated in the retail world. We will start to see seasonal employment in the less specialized areas of medicine. That would not be efficient, nor would it be good for the employees. I think we can all agree that steady employment is better. This seasonal lopsidedness would also mean that hospital facilities would be under-utilized at some times of the year, so the overall system would be less productive – meaning overall healthcare costs would rise even faster. This is something that needs to get fixed and fixed soon! It’s not quite time for Mad Max, but we see hospitals and insurers locked in a kind of death match in many markets. Fighting for pieces of a shrinking pie, they realize their best move is to get bigger and overwhelm other players. And that struggle is going to get more intense next year, because many of the cost cuts in the ACA were delayed this year, so hospitals are going to be getting even less revenue in 2016. Hospitals and insurers need each other. Hospitals cannot survive on Medicare and Medicaid reimbursement rates. They have to be in insurer networks to get higher-paying, privately insured patients. The insurers, meanwhile, need the hospitals because they have to offer patients a sufficiently broad provider network. If all the hospitals in a given region combine into one big system, they can demand higher rates from insurers. If insurers have a bigger percentage of the patients in a given area, they can dangle more volume in front of hospitals. This is why, just this year, we’ve seen Aetna acquiring Humana, and Anthem trying to buy Cigna. The trend is less obvious in hospitals since so many are nonprofit, but they are joining forces, too. The merger and acquisition action in the hospital field is at an all-time high and rising. It is a move to cut overhead, increase buying power, and create a better negotiating posture with insurers. Surprisingly to me, we have seen many fewer actual hospital closings than I predicted in 2011. The closed hospital trend is up but is still a fraction of the merger and acquisition activity. Mike, who keeps a close watch on the industry, notes that closing a hospital is painful to the surrounding community and that many hospitals are staying open even though they are losing money. They keep hoping something will change and they can figure out how to reduce costs and become more productive. It’s not all bad news, though. The Cleveland Clinic system has fared much better financially than most. Their available cash flow is up even though insurance reimbursement per patient is down. They accomplished this feat through aggressive cost-cutting that began even before 2012 and continues today. This proactive approach has helped to make the Clinic far more efficient and productive than most hospital systems. Further, the significant number of patients that were coming to the Clinic for free emergency medical healthcare – free because they couldn’t pay for it – has fallen dramatically, because now everyone qualifies for some kind of reimbursement. Even though government reimbursements are less than the actual cost of delivering the care, partial reimbursements are better than nothing; so in that way, at least, the ACA has helped the Cleveland Clinic’s business. An important effect of the higher deductibles is that patients are now much more sensitive about costs, especially for items that could be considered “commodity” procedures. A few years ago, if an MRI was ordered, it was done at the Cleveland Clinic for their standard price. Now patients are going across the street and saving a considerable amount. That’s happened in a lot of areas. Of course the Cleveland Clinic has adjusted by changing prices and becoming more productive. We haven’t even talked about drug costs yet. If stock prices are any indication, pharmaceutical and biotechnology companies were among the winners from healthcare reform. That may have changed in the last few weeks as media reports showed some companies taking “charge what the market will bear” a little too far. Hillary Clinton called it price gouging, and stock prices immediately dipped. I’m on the board of one publicly traded biotechnology company, so I see this issue from both sides. The companies – especially smaller startups and development biotechs – spend massive (as in staggering) amounts of money on research, with no guarantee of a payoff. The “win” (approval) ratio is sadly not as high as we would like. However, the rewards can be just as staggering. Think Gilead. Plus, even if a small biotech firm actually develops a drug that works, they will have only a limited time to sell it with exclusivity and to recover their investment plus a reasonable profit. Patients who pay high prices for their drugs and receive what seems to be only a small amount of medicine, don’t see the amortized development costs plus the risks that companies must cover. If the rewards for developing a new drug were the same as for developing new products in other industries, the pipeline of new drugs would be considerably smaller. That would not be good for any of us. As an aside, I am continually beating the drum about changing our drug approval process so that companies can get drugs to market faster and cheaper. That would be better for everyone. Effective drugs are usually worth whatever they cost. The problem is that many drugs are not as effective as we think, and differences in effectiveness are not always obvious. What has happened, unfortunately, is that some drug makers price their drugs insanely high simply because they know the Medicare system will buy them at those prices. Then they offer generous discounts and “patient assistance” programs to shield end users from the high list prices. This practice is great for a drug maker’s profit margin, assuming the drug works well enough that doctors prescribe it and patients use it, but it’s not a sustainable model for the system as a whole. The pharmaceutical industry will have to come to terms with that fact, as will its shareholders. While we’re are on the topic, the headline in the Washington Post this morning was about how drug costs could derail the entire massive Trans-Pacific trade deal that’s in the works. One of its provisions allows “biologics” to get at least five years of rights protection. To some people that’s too long, but to the drug companies in the US that currently get 12 years of protection, that’s a huge cut. This is a rather current development, as that section of the trade deal was just posted on WikiLeaks. Drug costs are nothing if not controversial. See, for reference, Hillary Clinton’s response to drug cost in creases recently in the news. Which is what makes pharmaceutical companies such easy targets. Then again, they are far and away the biggest lobbyists. I’ve thought for a long time that technology will save the healthcare industry. Sure enough, the revolution is starting to take shape. Everyone from IBM to Apple to small startups is finding ways to improve efficiency and reduce costs. IBM just opened a new headquarters in Boston for its IBM Watson Health unit. They are applying artificial intelligence technology to all sorts of data-intensive medical tasks. Apple added HealthKit and ResearchKit modules to the iOS operating system, enabling mobile apps to monitor health indicators, suggest improvements, and collect data for large-scale clinical trials. Google, under its reorganized Alphabet moniker, has a life sciences division reportedly working on several interesting initiatives. Their Google Glass wearable device, while it hasn’t been widely adopted by the public, seems to have found a niche with surgeons and other medical professionals who need hands-free visual data. What the big companies are doing is just the tip of the iceberg. Next week I’ll be visiting the Buck Institute, the world’s premier antiaging research center. If the stories I hear are even half-true, they are on the cusp of some major breakthroughs. Advances like these are not the only real, long-term solutions to the healthcare mess. Healthcare should aim to make people healthier, so we don’t need costly drugs or other interventions. If it does, the positive impacts will be profound. Healthcare is the main driver in our government’s dire long-term financial forecast. Help people be healthier and the rest will fall in place. The Cleveland Clinic has an ongoing experiment that shows that improving health while also lowering costs is possible. They are “experimenting” on their own 42,000 employees. Essentially, they offer lower-cost healthcare if an employee will do just five relatively simple things. This is all lifestyle common sense, but the results clearly demonstrate that a massive reduction in healthcare costs is attainable. Stop smoking. What a shocker. Exercise. It doesn’t have to be an aggressive program like Pat Cox or I (see below) do. The Cleveland Clinic simply asks you walk at least 30 minutes a day. Just get off your derrière and move. Make better food choices and control your portion size. What a concept. Dr. Mike is a good friend as well as my doctor, so we spend a lot of time together on the phone and as much time as we can in person. At his urging I have been making better food choices, although not as radical as the ones Mike would like me to make. I mean, if you’re going to make a big crock pot full of beans, you have to add some bacon. And maybe a ham hock. But I’ve begun to adopt a new “diet plan” that has been gaining some serious traction in the medical world. Both Pat Cox and Mike Roizen have been urging me to try it, and I’m finding it’s making a difference. I now weigh less than I have in a number of years, and I can actually see my theoretical goal in sight. Who knew? And I don’t feel deprived at all. Take your medicines, especially those designed to control blood pressure and cholesterol and chronic diseases. You would think this would be obvious, but a great many Americans simply do not take their pills, and not because they’re not available. Chronic disease is the big cost item in healthcare (see below). Manage stress. This is a little trickier, but a little time and effort spent on yoga, meditation, or other stress-relieving activities do make a big difference. That’s it. How big a difference has the program made at the Cleveland Clinic? It’s huge, says Mike. Enough so that if Americans adopted the above-mentioned lifestyle changes, our healthcare costs would come under control. Budget problem solved. Here are the numbers. The program started at the beginning of 2009, so it is been in operation for six years. For the last three years, the healthcare costs of the entire population of Cleveland Clinic employees have flat-lined. In a world where everybody else’s healthcare costs are going up by double digits, their costs have remained the same. But it’s even better than that. Their employees are getting older. After 47 years of age, 10% of the population will develop some type of chronic disease every year. By age 65, about 97% of us will have developed some form of chronic disease (high blood pressure, high cholesterol, etc.). The bulk of those problems will be either unmanaged or undermanaged. That neglect means high and rising healthcare costs. The five simple lifestyle changes mentioned above reduce the amount of and severity of chronic disease, and thus reduce healthcare costs. Not to mention that employee productivity at the Clinic is way up. Normally, with an aging population, healthcare costs are expected to rise. Controlling chronic diseases has saved the Cleveland Clinic $60 million a year, and the savings rise each year as the population gets even healthier. Smoking rates among Clinic employees have dropped from 15% to 5%. Body mass has gone down 0.5% a year while the body mass of the US population has gone up 2.5% a year. That’s a differential of 3% a year – every year – and compounding. It’s a differential of about 2½ pounds a person a year, every year. That means that after three years the Cleveland Clinic population is 7½ pounds lighter per person than the non-Clinic population. The incidence of high blood pressure and type 2 diabetes is also falling, and there are significant improvements in other healthcare issues as well. Other companies are paying attention and beginning to adopt similar programs. There is even serious talk in Congress – thankfully on both sides of the political spectrum – about adopting such a program into US healthcare policy as part of the reforms that need to be made. If you do not want to take responsibility for your own personal healthcare, then you are going to need more medical services, and it seems entirely reasonable that you should pay a little more for your health insurance. You don’t have to become fit overnight; you just need to make progress. Each of the above lifestyle changes can be measured by simple tests and observable outcomes. The program requires a little effort and some lifestyle shifts, but the benefits are obvious. There are very few people who can’t make these lifestyle changes. Extremely few. As in, I can’t think of any good reason to keep smoking or not eat reasonably or not actually exercise a little. Personally, and very frankly and bluntly, I think asking people to pay a little more for the insurance they need if they don’t want to take care of themselves is not unreasonable. Teenagers and those who are clearly not safe drivers have to pay more for auto insurance, because they are more reckless. (There’s a pun in there somewhere.) Asking people whose lifestyle is reckless to pay a bit more for their health insurance is no different. We have long known that the rich live longer. The average upper-income 50-year-old man can expect to live to 89, but the same man if he is lower-income will live to just 76. Part of the difference is being able to afford more healthcare, of course, but an even bigger part is lifestyle. Studies show that more-affluent Americans have significantly reduced their smoking, but the poor have not. The poor tend to be more obese. The wealthier can afford to make healthier and better food choices. And some of the difference in longevity is clearly due to stress levels and chronic lack of exercise. It’s hard to be precise about these differences, as the data can be interpreted in a lot of different ways. But it’s clear that we need to somehow make a massive shift in the way we approach our lifestyles. I have been writing this letter for 16 years. A lot of you have been reading me for much of that time, and the one thing we all have in common is that we’re getting older. Since I want all of my friends (and if you’re reading this letter you’re one of my closest friends) to be as healthy as possible – so that I can be writing and you can be reading me for many years to come – please get your health act together, if you haven’t already. Let’s see if we can end every year a little bit healthier, wealthier, and wiser. More on diet and aging below. The editor of Transformational Technology Alert, my close friend Patrick Cox, will be coming in Sunday, October 11, for a dinner and to meet a few of his readers before we head out the next day to San Francisco, where we will hopefully meet with Dr. Mike West of Biotime and then spend the next day at the Buck Institute, the premier antiaging research center in the world. I hop a later flight to Portland, where I will be doing a speech for Aequitas Capital. The plan is that we’ll somehow wind up in Jersey Shores by the late weekend for meetings on Monday and then take the ferry to Manhattan for a day before heading back. I’m a little surprised, but 30 people are planning to show up Sunday evening to meet with Pat and me in my apartment; and after conversations and questions we’ll all walk over to the Stoneleigh P. Both Pat and Mike Roizen have gotten me on a “new diet” that has a considerable amount of research and medical backing behind it. It is called a fasting mimicking diet. Basically, the idea is to spend about four or five days a month taking in less than 800 calories a day and then go back to simply eating healthily. The theory is that this mimics the feast-and-famine world that humans evolved in. Studies have showed that the diet helps reduce visceral belly fat (the really evil fat that is usually the last to go), and it increases the number of progeny among stem cells in several organs, including the brain, at least in mice. We have long known that calorie-restriction diets increase longevity in mice, but not many studies have been done on humans. However, my science-fiction writer friend and professional contrarian David Brin points out that there have been numerous long-term studies done on calorie-restriction diets. Monks at Buddhist monasteries and those who lead similar hermetic lifestyles are excellent populations for study. So far, we don’t have any 150-year-old monks, so the comparison to results in mice may not apply; but it seems like a reasonable concept to me. And the research does show that a healthy lifestyle and something like the fasting mimicking diet do reduce the markers that accompany chronic diseases and premature aging. “Strict fasting is hard for people to stick to, and it can also be dangerous, so we developed a complex diet that triggers the same effects in the body,” says Valter Longo, Edna M. Jones Professor of Biogerontology at the USC Davis School of Gerontology and director of the USC Longevity Institute. “I’ve personally tried both, and the fasting mimicking diet is a lot easier and also a lot safer” (source). You can Google “fasting mimicking diet” and get tons of research and reports. I’ve been trying this approach for a little while, and it’s clearly helping. My traveling lifestyle isn’t very conducive to a normal diet structure, but I can generally find five days a month when I can reduce my calories. I’m slowly dropping my weight back to where I want it to be, although I’m not going to try to get to where those silly one-size-fits-all weight charts say I should be. I would then be appallingly skinny. I know that because when I weighed that much as a kid I was appallingly skinny. I am simply going for healthy. It’s time to hit the send button. If we can work it out, Patrick and I will report on what we learn of the latest news on the antiaging front from having dinner with Mike West of Biotime and the professionals at the Buck Institute. Pat’s editor for his new book will be joining us. His book will be out shortly, and it’s going to be a must-read. IMF head Christine Lagarde says "IMF credibility is at stake". She blames the US for that development, and calls on US to give more voting power to China to solve the problem. I have a simple question: Precisely what credibility does the IMF have? As the following chart compiling the IMF's various quarterly economic forecasts over the past 5 years clearly shows, what the IMF had actually forecast, was a constant hockeystick rebound in China growth starting in 2011... until 2014 when the monetary fund finally gave up. "The IMF's forecast of China's growth after the fact is now so negative, it is well below the consensus projections, as the IMF is all too happy to boast ..."
The IMF's credibility has been magically restored by impressive revisionist history. But as we see today, that credibility is once again at stake. Meanwhile, please note the IMF is concerned that a $3 Trillion Corporate Credit Crunch Looms as Debtors Face Day of Reckoning. Governments and central banks risk tipping the world into a fresh financial crisis, the International Monetary Fund has warned, as it called time on a corporate debt binge in the developing world. Emerging market companies have "over-borrowed" by $3 trillion in the last decade, reflecting a quadrupling of private sector debt between 2004 and 2014, found the IMF's Global Financial Stability Report. This dangerous over-leveraging now threatens to unleash a wave of defaults that will imperil an already weak global economy, said stark findings from the IMF's twice yearly report. Q. How did this happen? A. The answer of course is corporations took on insane amounts of debts precisely as central banks and the IMF wanted them to do. Q. Why did the IMF and central banks encourage this debt? A. To help stimulate the global economy. Q. So why do they think still more debt will fix a problem caused by debt? If the IMF wants China in the name of credibility, please let them have it. In return, I ask one simple thing: The US cuts off all IMF funding, as it should have done long ago.